Page created by Marion Cheucle, PhD, University of Lyon 2, DDL – Language Dynamics – laboratory. Thesis: Bekwel in Gabon, description and documentation of an endangered language. A sociolinguistic survey by Phillips (1993) reveals five linguistic varieties in Congo: Zalagee, Ebaa, Mekwoob, Mebeeza, Koolo. 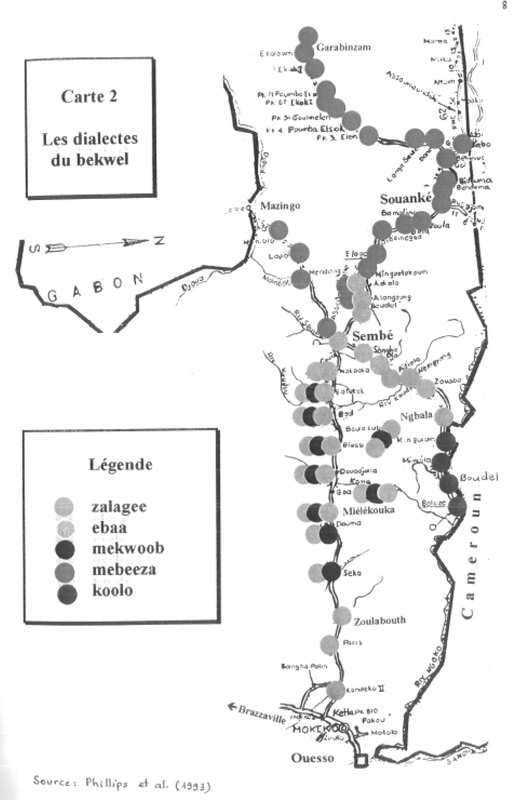 Bouka (1995) verifies two Bekwel dialects in Congo: an eastern dialect including Mekwoob, Ebaa and Zalagee, and a western dialect consisting in one single variety, Mebezaa. In Gabon, along the Invido river, the Bakwele do not speak Mebeeza, nor Ebaa, nor have they ever heard of Zalagee or Koolo. Informants mention Ebit and Ibongho, and some speak Mekwob. Documentation in Bekwel in Cameroon is scarce. 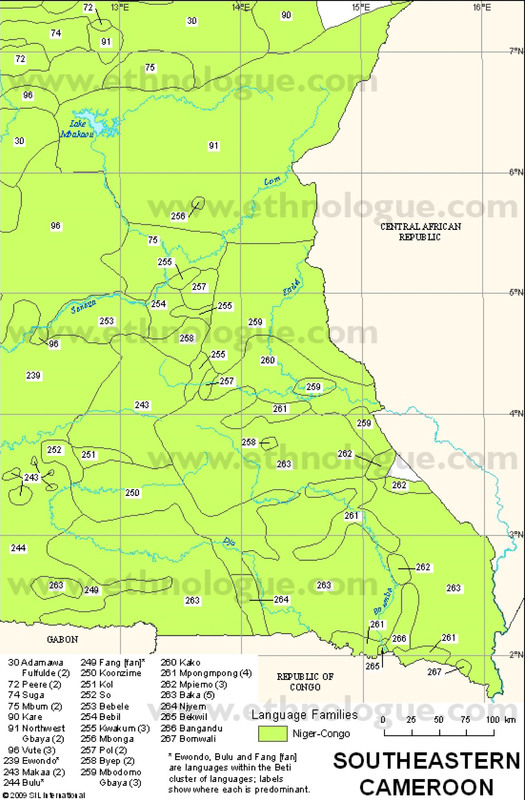 This map by the SIL locates Bekwel in Cameroon (265). In Congo, two maps by Phillips (1993) locate Bekwel according to its geographic situation and its dialects. 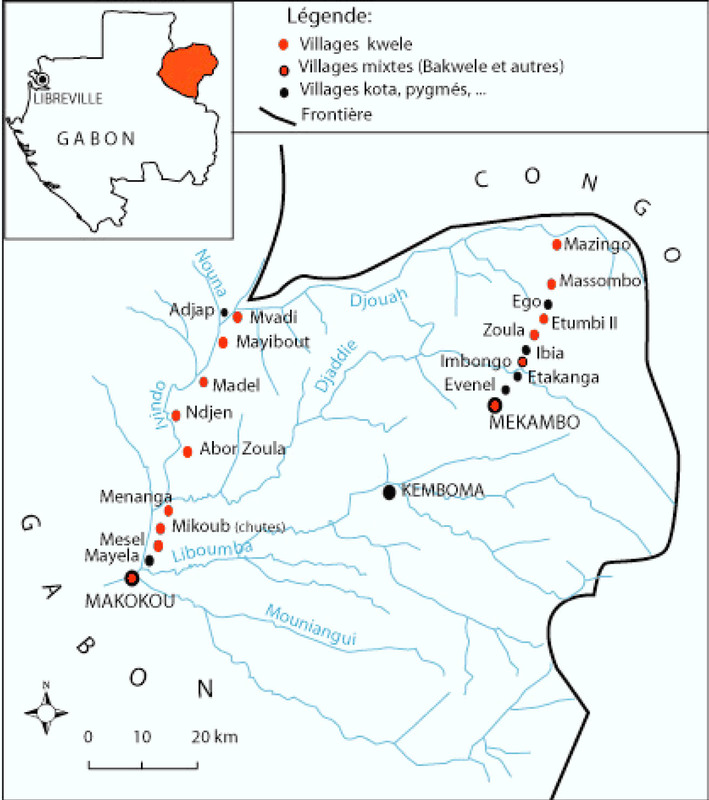 In Gabon, Bekwel is spoken in the Ogooué-Ivindo province. Most of the Bakwele live on the left bank of the Invido. They live in the villages of (North to South) Mvadi I, II, and III, Mayibout I and II, Model, Ndjeng, Abor Zoula, Menanga, Mekob, and Zoatab (district of Makokou). The “North canton” Bakwele live in Mazingo, Massombo, Etumbi II, Zoula, and Mekambo. 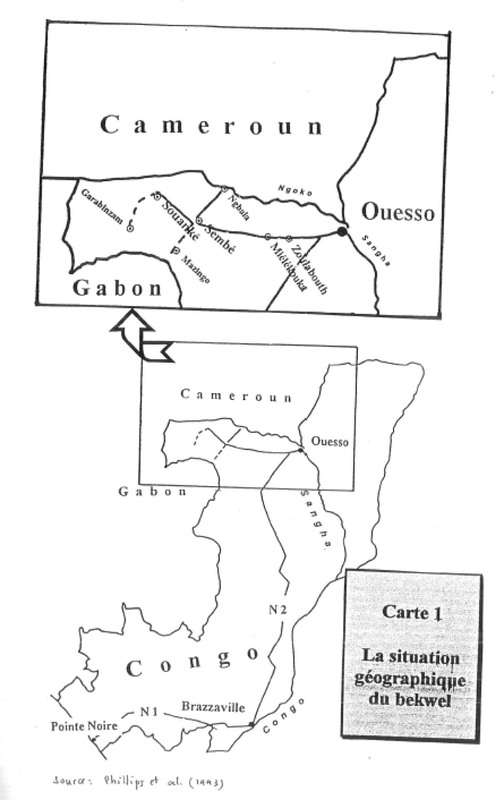 This other map shows how the Kwel people are shared over the region of Djouah, Gabon (CHEUCLE, 2007). Estimates account for 2,000 to 3,000 speakers in Gabon. 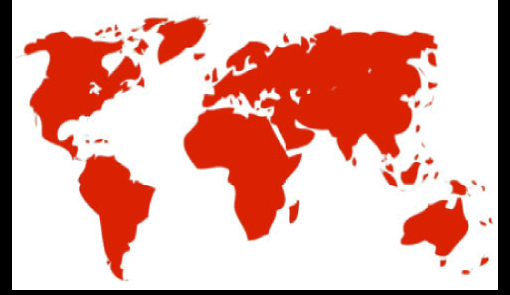 No available data on Cameroon. The Ethnologue accounts for 9,600 speakers in the Sangha department, Congo. French is the official language of Gabon. Among various other fields, it is used in education and written communication – whether economic, political or administrative. Thus French is the language spoken in the media, courts of justice, schools, etc. This chart shows the degree of vitality of Bekwel in Gabon, according to UNESCO criteria (CHEUCLE 2007). Nowadays, the language is handed down to children in villages, and it is the only language spoken by some of the seniors. However, the rural-urban migration is forcing the Bakwele out of their linguistic context. Little by little, the command of the language by younger generations is declining. In spite of the language’s apparent vitality today, there is no guarantee on its future considering the low number of its speakers, the urban migration, and the growing impact of French. Bekwel is hardly known in Gabon, except in the area where it is spoken. Education, administration, and the media, all use French. There appears to be no literature in Bekwel, nor standardiaztion of the language. In Congo, J. Phillips is working on the creation of a spelling system in Bekwel. The ancient origin of the Bakwele is not known. In a more recent history, the Bakwele are believed to have arrived from Cameroon before scattering over Gabon and Congo. An ethnic conflict might have played an important part here: the “Pupu war”. The presence of Bakwele in the Djouah region (Mvadi) could be a consequence of a “Banana war”.